It’s Thursday again, and that means it is time for another installment in the ongoing Crossroads genre mash-up series over at Amazing Stories. This week, we continue this month’s “espionage” theme by exploring how estrangement is both the shared and dividing element of espionage fiction and speculative fiction. In particular, I take a look at how SF/F’s degree of estrangement affect the narrative tension and applicability of espionage themes to readers’ real-world tensions. There’s even an info-graphic! I hope you’ll stop by and join the conversation. Over the past several months, I’ve written a number of posts about professionalism in the speculative fiction field (here, here, and here). Today, at least one of those threads of controversy – the question of Theodore Beale/Vox Day’s continued membership of SFWA – has reached an inflection point. Today, the SFWA Board communicated to Vox Day (privately, though its recipient proceeded to publish the relevant correspondence on his blog) that upon review of the initial investigation findings, and consideration of his response to those findings, that as a Board they had voted unanimously to expel him from SFWA’s membership. Per Twitter, they communicated that a member had been expelled (without naming that member) to SFWA members via e-mail. And finally, the Board released an official statement confirming the expulsion (here), still without naming the expelled member. SFWA’s expulsion of Theodore Beale/Vox Day makes a powerful statement about standards of professional conduct in the field of speculative fiction. SFWA’s Board has demonstrated that bigotry and the abuse of official professional platforms to promulgate the same are considered grossly unprofessional. In other words, SFWA and the professional SF/F world it represents have taken a big step forward to catch up to the standards of professionalism that apply outside of our genre. SFWA has put unprofessional bigots on notice, and thus raised the professional caliber of the organization and the field it represents. The organization, its membership, and the entire SF/F community still have work to do. Establishing, communicating, and maintaining standards of professionalism cannot be accomplished by a single stroke of the pen. But today’s announcements make the SFWA Board’s intentions – and the direction of their leadership – plain. I support a leadership which consigns bigots to the dustbin of professional irrelevancy. I support SFWA’s decision to expel Theodore Beale/Vox Day. And as soon as I am qualified? I will support SFWA and the speculative fiction field with my membership dues. Another Thursday has dawned, and that means it’s time for my weekly Crossroads post over at Amazing Stories. Continuing this month’s exploration of espionage fiction and the ways it intersects (or fails to) with speculative fiction, this week I take a deep dive into the narrative techniques and thematic focus characteristic of spy fiction from the last century. From William Le Queux and the pre-WWI British invasion stories down to today’s work by Daniel Silva et al, I discuss how these authors build their worlds, play off their reader’s pre-existing apprehensions, and how they generally approach their stories and themes. I hope you stop by! Much as I love genre theory, I typically steer clear of taxonomic debates. I find that genre classification tends to put the cart before the horse, to be the critical equivalent of describing an engine in terms of its color. Most such debate reduces to a collection of observations that do little to advance our understanding of how narrative mechanisms actually function. Yet over the weekend, Ian Sales posted a thought-provoking essay which diverges from this general rule. Unlike most attempts at genre taxonomy, Sales’ definition of speculative fiction tries to be systematic and comprehensive, built from a set of first principles articulated in previous essays on wonder and the source of agency in SF/F. On balance, Sales’ focus and clarity of thought make his proposed definition that rare critical beast: a critically helpful taxonomic construct. Unfortunately, Sales’ definition of speculative fiction is also flawed. Where Do Definitions Come From? A useful definition has to describe something intrinsic to the text, not something extra-textual. If a taxonomy is to be valid, true, and useful then it must emerge from the texts being analyzed. While I know some in the arts who look askance at the scientific method, basic logic suggests that a viable theory must be supported by repeatable observation. If we wish to define a genre, we must point to the identifiable and unique features of that genre. Romance, for example, benefits from a beautifully succinct definition: “Two basic elements comprise every romance novel: a central love story and an emotionally-satisfying and optimistic ending.” One could likely come up with something just as elegant for mystery/crime or westerns. But it is the broad, all-encompassing categories like speculative fiction and mainstream literature whose defining characteristics become harder to pin down, and that is because the reasons we enjoy them often occlude their underlying structures. Dragons, aliens, magic, faster-than-light travel, etc. are extremely rare in mainstream literary fiction. When we read speculative fiction, they can offer us that pernicious “sense of wonder” which so often muddles critical analysis of the genre. On a superficial level, identifying speculative fiction by its devices has the simultaneous benefit of being easy and rarely incorrect. But it is a superficial and facile approach that fails to tell us anything about either how the narrative is constructed or how that construction contributes to its effects. Sales is right to point to the weakness of identifying genre based on the devices that appear in the text. Just because a book features dragons or elves does not mean it is fantasy (or rather, does not mean it isn’t science fiction). Consider the science fictional treatment of dragons in both Marie Brennan’s A Natural History of Dragons: A Memoir by Lady Trent (which I discussed at greater length here) and Michael Swanwick’s The Iron Dragon’s Daughter, or Gene Wolfe and Jack Vance’s fantastical treatments of hard science in The Book of the New Sun and Tales of the Dying Earth, respectively. As these works make clear, genre taxonomy cannot be reduced to a checklist of tropes. How such devices are used in the text and their relationships with the narrative’s characters, plots, themes, and settings have a greater significance than the mere fact of their mention. While Sales’ stated goal (to define speculative fiction using characteristics intrinsic to the text) is one with which I am in complete agreement, I fear that his definition falls wide of the mark. Of his two defining criteria (wonder and [the source of narrative] agency), fully one half is external to the text and based entirely on a reader’s subjective, individual experience of the narrative. “Sense of wonder” is a critically contentious term that seems to come in and out of vogue every generation. I personally subscribe to the belief that it does have critical value, but only insofar as one of several diagnostic tools. Its utility as a criterion for definition is limited by the fact that our mileage may vary. Sales argues – in line with reasoning by Romanian SF critic Cornel Robu – that “wonder” is centrally concerned with scale, and that science fiction fosters a sense of wonder through the actualization of scale in the reader’s perception. To be clear, this is not a bad way of thinking about wonder. But it is a very specific, highly individual, and rather limited one. In my own reading, I find that many concepts, images, devices, and even phrases can foster a sense of wonder. For me, it isn’t all about scale: It may also relate to emotional intimacy (e.g. John Crowley’s Little, Big), or spirituality (e.g. James Blish’s A Case of Conscience), or mathematical or rhetorical elegance (Greg Egan’s The Clockwork Rocket and Elizabeth Bear’s Dust, respectively). Many have written about “wonder” as touching on the sublime, verging on the transcendent, or as enabling a reader’s conceptual breakthrough. As a concept, it has descriptive value. But its own definition is imprecise, and that very imprecision stems from the term’s innate subjectivity. Wonder is a quality intrinsic to the reader’s experience, and not to the text. As a result, an epistemological definition of speculative fiction that uses wonder as one of its two legs cannot stand. “Sense of wonder” is neither a quantifiable nor an independently repeatable observation that can be made for a given text. This weakness is further supported by Sales’ own (admittedly tongue-in-cheek) equation for quantifying wonder, which itself relies on four inputs which are personal to the reader and have nothing to do with the text in question. Science fiction and fantasy can be differentiated by the narrative text’s implied prime mover. Fantasy’s implicit prime mover is the author, while science fiction’s implicit prime mover is deterministic natural law (which is, admittedly, often conceived and communicated by the author). Of course, the author in all cases has control over both the narrative and their fictional world. However, what Sales really highlights isn’t the question of how the story is imbued with narrative agency. Rather, it is the implied author’s relationship/attitude towards their fictional reality. If the text communicates the implied author’s attitude as explicitly deterministic or naturalistic, then the work is likely to be science fictional. If the text communicates that attitude as either unexamined, theological (even given a fictional religion), or metaphysical, then the work is likely to be fantasy. Such a characterization seems to be broadly consistent with Sales’ use of “agency”, yet such a distinction is useful inasmuch as it helps us to differentiate science fiction from fantasy. However, it does little to differentiate speculative fiction from other more mainstream genres. Rather than utilize “wonder” as the definition’s second axis, I would instead suggest the centrality of the speculative/impossible to the plot. The more speculative the plot, the more likely a given work can be deemed speculative fiction. That seems somewhat tautological, but it allows us to neatly place any work of fiction along a spectrum of “speculation”. This alternative definition seems to be less susceptible to edge cases than Sales’ original: By taking into account the totality of the implied author’s relationship to their fictional reality, works like Alfred Bester’s The Stars My Destination can still be comfortably classified as science fiction despite their central speculative conceit going relatively unexamined. 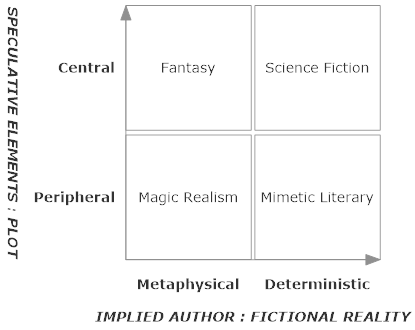 At the same time, by exploring the speculative elements’ relationship to the plot (as opposed, for example, to the theme) we can differentiate works of magic realism like Gabriel Garcia Marquez’s One Hundred Years of Solitude from secondary world fantasies like Tolkien’s The Lord of the Rings. Speculative fiction is fiction where speculative elements (i.e. devices of the fantastic, scientific extrapolation, impossible conceits, etc.) are central to the narrative’s plot specifically, irrespective of their relationship to either theme or character. Fantasy is speculative fiction where the implied author’s relationship to the fictional reality is unexamined, theological, or metaphysical in nature. A fantasy’s implied author accepts the fictional reality without necessarily trying to explain it. Science fiction is speculative fiction where the implied author’s relationship to the fictional reality is deterministic or naturalistic. A science fiction’s implied author assumes and communicates an explicable fictional reality. By focusing on the relationship of a narrative’s speculative elements to its plot and the implied author’s attitude towards their fictional reality, we gain the ability to discuss the use of the fantastic and the speculative as metaphors and conceits, and to apply that discussion against narrative structure, techniques of characterization, and narrative subtext. In other words, these definitions provide us with increased analytical clarity and precision – which is what definitions are meant to provide. Welcome to August! Today’s the first Thursday in August, which means that it’s time to kick off a new Crossroads series over at Amazing Stories. This month, I’m going to be taking a look at the ways in which spies, espionage, and spy fiction in general intersect with science fiction and fantasy. This week, I start by describing a bit of the history of espionage fiction, and then wonder about if and why (despite mainstream spy fiction’s commercial and critical success) its archetypes, structures, and techniques are not frequently adopted by speculative fiction. I hope you stop by! So for much of the last two weeks I’ve been kept offline by travel (yay 4th Street Fantasy!) and offline life doings. Now that life is starting to settle back down, I’ve entered catch-up mode. When I left for Minnesota, much of the discussion was focused on the controversy surrounding SFWA’s Bulletin, N.K. Jemisin’s GoH speech, and Theodore Beale/Vox Day’s racist response to it. I wrote about these issues here and here. While I was away, the SF/F corner of the internet has been quite busy (for a good timeline, I recommend S.L. Huang’s post here). Convention Harassment Policy Pledge. Former SFWA president John Scalzi posts a public description of his newly-adopted convention attendance policy, wherein he categorically states that should a convention not have a harassment policy or fail to communicate such policy clearly to its members, he will not attend that convention in any capacity (e.g. as a Guest of Honor, panelist, fan/member, etc.). Scalzi’s Policy Gains Co-signatories. Many other writers, fans, publishers, and editors (as of this writing, over 550 and counting) across a myriad of genders and backgrounds co-sign Scalzi’s Harassment Policy pledge. SFWA Bulletin Task Force Announces Next Steps. SFWA’s Bulletin Task Force (established in response to the SFWA Bulletin controversy) announces that all Bulletin contributors have been paid for their contracted work despite the Bulletin’s publication being suspended. SFWA’s statement furthermore reiterates and clarifies plans for a survey to be delivered to members to get a better sense of what the organization’s membership expects of The Bulletin. SFWA Proceeds with Vox Day/Theodore Beale Matter. Following complaints about SFWA-member Vox Day (aka Theodore Beale)’s racist attacks on fellow SFWA-member N.K. Jemisin and his abuse of SFWA promotional tools to disseminate same, many SFWA members have begun calling for Day’s expulsion from the organization. SFWA has responded by following its organizational procedures and compiling a confidential investigative report and sharing it with Vox Day for his response. Vox Day chose to publish the e-mail correspondence in question (note: again, FWIW, I choose not link to Vox Day’s blog here, but a quick Google search will find it), though not the contents of the investigative report itself. Why do these four events give me hope? Because they are all markers of an increasingly professional response to the cultural drama unfolding in the SF/F community. Scalzi’s harassment policy pledge is a statement of professional standards. It articulates a clear set of expectations that all conventions can and should be held to. One can quibble as to whether or not his standards go far enough or fall short, yet they remain a reasonable set of standards nevertheless. And while they are his personal standards, the fact that so many people active and involved and passionate about the genre agree with them lends credence to the belief that those who disagree are a small and dwindling minority in the community. I am saddened that as a community we still need such clear and plain-spoken standards. I am disappointed that such standards are not simply a “given” in our cultural makeup. But I am proud that as a community we can articulate these expectations and that so much of the community supports them. I see this as a sign of burgeoning professionalism in the community. I sympathize with SFWA’s new Board. They probably had a rough first week. However, SFWA’s behavior speaks well of the Board’s attitude towards professionalism. The Board treated its business partners (the writers who had been contracted to write for the Bulletin) honorably and correctly, as befits a professional outfit. As an organization that represents writers, it would have been an egregious act of bad faith to have stiffed its own constituents. Thankfully, SFWA took the high road and did exactly what it should have. I applaud the Board for its professionalism. I have more mixed opinions on the announced Bulletin survey. On the one hand, seeking to get insight from SFWA constituents is a professional response to the high emotions and rhetoric surrounding the recent controversies. Regardless of the task force’s ultimate decision(s), such a survey will simultaneously help give SFWA’s leadership insight into the current mindset of the membership and will give that membership a chance for its voice/views to be heard. This is good. This is professional. This is as it should be. However, having spent my professional career in the world of market research, I am less confident that a survey of dissatisfied customers (i.e. Bulletin readers/SFWA members) is a good way to design a better product going forward. It is notoriously difficult for a survey respondent to offer meaningful recommendations to a researcher, particularly in a quantitative tool. Yes, it can be done, and yes, a survey can be well-designed to elicit more practical / meaningful data. But it is not easy, and the quality of data that SFWA gets from its survey will be directly dependent on both the questionnaire that SFWA designs and the response rate that SFWA achieves. It leads to me wonder whether SFWA will be designing the questionnaire or conducting the research in-house or contracting it out to a professional? Still, that is ultimately the technical challenge of executing on the published plan. As it stands, SFWA’s Bulletin Task Force has been proceeding exactly as it should in responding to the controversies surrounding the Bulletin. The Task Force’s response has been measured, responsible, and professional. Which is exactly as it should be. SFWA’s proceedings on the Vox Day matter are equally telling. From an outsider’s perspective, the e-mails which Vox Day chose to publish (which I currently assume are accurate) are procedural, bureaucratic, and precise. They are unambiguous and procedurally even-handed. They are downright boring. Which is again exactly as it should be in a professional organization’s professional conduct. Some may complain that SFWA should move faster or should make its proceedings in regards to Vox Day public, but I strongly disagree. Due process – even in a private organization which defines for itself what such due process is – matters. Responsibly and completely investigating the complaints against Vox Day/Theodore Beale and giving him time to respond is exactly what the organization should do. And this cannot – and should not – happen overnight. The confidentiality of these proceedings is a somewhat more debatable choice. I can see arguments both for making the proceedings public (to give constituents insight into the proceedings/decision-making process) and for keeping them confidential (to protect everyone: those who complain, those who have been accused, those who defend the accused, and the organization itself). As it stands, SFWA’s Board has chosen to keep the proceedings confidential. I am not certain I agree with that choice, but I can respect it as reasonable, responsible, and (again) professional. Vox Day has chosen to only partially respect the confidentiality of SFWA’s proceedings, attempting to use that very confidentiality as a stalking horse to appear victimized. This is an unprofessional attempt to shift the proceedings into an inappropriate forum: it is not the internet’s job to adjudicate this matter. That is the right and responsibility of SFWA’s Board. As I said in my last post on this subject, I won’t opine on whether Vox Day should remain a member of SFWA or not. I’m not (yet) a member, so my voice in this regards should be meaningless. In this process, it is SFWA’s Board (and ultimately SFWA’s membership) which sets the rules. That’s just the way professional governance works. By publicly flouting the rules, Vox Day is sending a clear message to SFWA’s Board and its membership: He does not respect SFWA’s right to govern itself, nor does he respect the professional approach SFWA’s Board has adopted. But in all of this, what makes me smile is the fact that SFWA – and SFWA’s freshly-minted Board – is approaching all of this with a reasonable, responsible, and professional approach. Which is exactly what I would want from a professional organization. And all of this gives me increased hope that – slowly, very slowly – the tempest I first wrote about a month ago is beginning to ebb. A little over a week ago, I wrote a post responding to the dialogue written by Mike Resnick and Barry Malzberg and published in SFWA’s The Bulletin #202. In that post, I tried to point out the (serious) flaws in their reasoning, and to simultaneously question the wisdom of including such flawed content in an official trade publication. Since that post went live, I have watched the Internet (or at least our genre corner of it) explode with fury: directed at Resnick/Malzberg, directed at Bulletin editor Jean Rabe, directed at SFWA, directed at SFWA’s leadership, directed at critics, directed at men, directed at women, directed at young people, directed at old people. Watching the cultural debate unfold across blog posts, comment threads, forum discussions, and tweets, it often seems that the only ones who have escaped unscathed are dogs, cats, and certain species of tropical fish. For a decent sense of the rhetoric flying around, I recommend Jim C. Hines’ link roundup post. First, Vox Day (a SFWA member and losing candidate for the SFWA presidency, a.k.a. Theodore Beale) publicly posted a racist screed attacking N.K. Jemisin in which he repeatedly refers to her as a “half-savage” and states that a “society of NK Jemisins…” (read: people of color) “…is [in]capable of building an advanced civilization, or even successfully maintaining one without significant external support from those white males”. I won’t link to Vox Day’s blog here, but Google will quickly lead you to it. SFWA members and non-members alike have responded to Day’s detritus by criticizing his reprehensible and hate-filled views, and calling for his expulsion from the organization. Amal El-Mohtar in particular has written an eloquent and logical indictment of Day’s actions, making a case for his expulsion from the organization based on SFWA’s current by-laws. Today’s second event relevant to the discussion is SFWA’s publication of a three-step plan (apparently mis-titled as a four-step plan) to address concerns about the SFWA Bulletin. The plan is brief (having only three steps), but it lays out a reasonable and professional approach to examining options, formulating plans, and implementing them in a reasonable time frame. SFWA’s plan is a step in the right direction, and raises the question of how it should be done. And here is where today’s two events – and the past week’s controversy over the Bulletin – converge on the issue and definition of professionalism, and SFWA’s role in promoting professionalism amongst its members. The current controversy surrounding SFWA has two facets: the first is criticism of individuals for their condescending attitudes, offensive words, and reprehensible actions. When it comes to Resnick/Malzberg’s condescending and offensive “dialogue” I agree with much of that criticism (as I said unequivocally here). When it comes to Vox Day’s vile hate speech (which I have not discussed before), I would like to state my position clearly: such discourse is disingenuous, argued in bad faith, and offensive in the extreme. It is designed to do little more than stir greater controversy. Our genre and our species deserves better. While I agree with criticism of the individuals and the views they espouse, I don’t think either Day or Resnick/Malzberg are likely to change their words or values based on such criticism: Resnick/Malzberg implied as much in their much-maligned most recent Dialogue, and I take them at their word. Which is why (as I said earlier), I think it is pointless to argue with them. In a similar fashion, I think it unlikely that Vox Day (given his longstanding penchant for racist and misogynist writing) will ever re-examine his positions. Yet the second facet of this controversy arises from the relationship of such individuals to SFWA as a professional organization. And here, the cases of Resnick/Malzberg and Vox Day are very different. In the case of Vox Day, his actions today were in clear violation of the terms under which SFWA members can benefit from the @SFWAauthors Twitter handle. The organization responded promptly and correctly, deleting the (presumably automatically generated) retweets. Whether this violation is sufficient to expel him from the organization (as Amal El-Mohtar advocates here) is unclear to me, but I would not shed a tear if the Board were to expel him. This is a question of SFWA’s bylaws, and their application by SFWA’s Board. But Vox Day and his racist views are personal views, separate from the SFWA Bulletin. We can and should condemn them vocally. But Day is not a representative of SFWA, and to outside observers it would be difficult to construe his hate-filled words as being endorsed by the organization. Most of us can spot a crank when we see one, and the organization was quick to rectify the retweet of his blog post. More troubling are the cultural implications of Day getting about 10% of the vote for the SFWA presidency. But those implications are a separate issue, with long-term consequences for the genre and for broader society. We will continue to debate them for years to come, and hopefully we will do so in a polite and professional fashion. Resnick/Malzberg – and the attitudes they displayed in their Dialogue – are a more immediate concern, and a more complicated case. Unlike Vox Day, they were published in SFWA’s official publication. The organization (read: the members) paid for their words. This lends their words greater weight than the essays of Vox Day. The implied official sanction of Resnick/Malzberg’s attitudes raises questions about SFWA’s commitment to diversity, its openness to new voices, and its respect for all writers and readers. Resnick/Malzberg and the SFWA Bulletin controversy highlight a disconnect between the standards of professionalism many of us assumed applied to The Bulletin, and the standards which were actually applied by the Bulletin’s editor (and tacitly approved by SFWA president John Scalzi, as he states here). In this dimension of the debate, it is not the single, specific offensive article that matters but rather an escalating pattern of publishing “unprofessional” material. What does it mean to be a “professional” trade publication? And what implications should that have decision have on the content of The Bulletin? I’ve been thinking about these issues for the past week or so and discussing them with uniformly civil, respectful people in the comments here, on Twitter, and on various discussion boards. For your consideration and debate, this post will answer them according to how I think. I may be wrong, and I may be foolish, but only by focusing on those questions are we likely to affect any kind of systemic change (whatever such change may be). The Bulletin is an edited magazine, produced by SFWA and distributed to SFWA members and non-members alike. It is a trade publication, meaning that its mission is to discuss the business of writing. Because SFWA is an organization for science fiction and fantasy writers, The Bulletin focuses its attention on the business of writing science fiction and fantasy in particular. As an organization, SFWA puts great store by the term “professional”. Consider its painstaking definition of what constitutes a “professional” market, and by extension the qualifications necessary to be an Active member. Since its members are specifically “professional” science fiction and fantasy authors, by logical inference one could expect its trade publication to adhere to certain standards of professionalism. Such standards – whatever they may be and however they get defined – fundamentally shape the magazine’s content. They affect which articles are bought for publication and which illustrations are purchased for the magazine’s cover. They influence the interior design and the ordering of articles within each issue. And they inform how content is revised prior to publication. Whatever standards (lax or not, appropriate or not) had been applied to The Bulletin are the proximal cause of the current controversy, and all concomitant unpleasantness. So who decides what those standards should be? Considering that it is SFWA – a member-funded, volunteer-run organization – who publishes The Bulletin, it stands to reason that SFWA members should ultimately decide those standards. But how should that work in practice? It is laughably impractical to subject every editorial choice to a vote amongst SFWA’s almost 2000 members. SFWA needs (and I believe has) mechanisms to define and arbitrate such standards, particularly through the executive authority of its elected Board. I am not well versed in SFWA’s bylaws, but my understanding is that SFWA members elect its Board and its Board manages the execution of the organization’s mission. Publishing The Bulletin falls within that mandate, and by extension so does the setting of standards to which The Bulletin should adhere. Does that mean that a Board vote need be taken to approve every editorial choice? No, because that too would be ridiculously impractical. 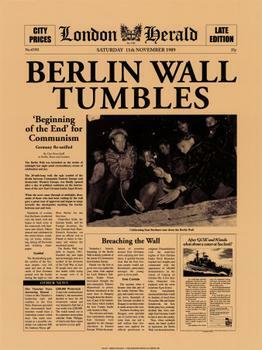 Instead, the Board delegates such editorial choices to The Bulletin’s editor – in this case Jean Rabe (who has since resigned). For such delegation to be effective, the standards of professionalism determined by the Board should be articulated and agreed with the editor. In the case of The Bulletin’s most recent issue, and judging by John Scalzi’s statement, it would seem that such shared understanding was not achieved. As SFWA moves forward, I believe that the Board should specifically take considered steps to ensure that The Bulletin’s editor and the Board are actually aligned on whatever definition of “professional standards” the Board (or Task Force) settles on. That’s just responsible management, and I am pleased that the Task Force’s initial plan seems to recognize this need. In the event that SFWA members disagree with the Board’s managerial decisions? Addressing such concerns is what SFWA’s election process is for. So what should “professional” mean in this case? Which brings us to the question of what “professional” means. This is something I have been thinking about quite a bit in the past several days, particularly observing the hurt, offense, and sense of betrayal that this controversy has spawned on all sides of the debate. And the more I think about it, the more convinced I become that any discussion aspiring to “professionalism” should focus on the work, and not on extraneous considerations which distract from that work. Consider: when was the last time we saw such controversy erupt over an article in Plumbing and Mechanical (a plumbing trade journal)? Why don’t we see such vitriol and controversy in most professional trade publications? I think the reason is because they keep personal issues and opinions out of the publication. The gender attitudes, racial prejudices, political opinions, religious beliefs, fabric preferences, etc. of someone writing about spot-welding techniques, contractor advertising strategies, or the history of copper tubing are utterly irrelevant to the work. Why should it be any different for someone writing about plot structuring techniques, book publicity strategies, or the history of the SF/F genre? When I go to industry conferences outside of the SF/F community – when I hang out at media research cocktail parties and speak to other professionals – you know what rarely comes up? Politics. Religion. Gender values. Racial prejudice. Why? Because that’s not what we are there to discuss. We are there to discuss the work. I have no more right to force my views on others than they do to force their views on me. I may disagree with those views (and boy do I ever disagree with Resnick/Malzberg and Vox Day! ), and I may voice that disagreement, but that’s as far as it goes. The best way – therefore – to keep the conversation at a professional level is to avoid personal issues that have no bearing on the subject at hand. Does this mean that we should “ban” gender, racial, or political discussions from our professional discourse? I would hope not! Questions of diversity, inclusion, and openness are vitally important to the genre’s long-term health. But there is a fundamental contextual difference between discussing personal gender attitudes as a subject in itself (e.g. “Person X is a misogynist!”, or “Person Y is a liberal fascist!”, or “SFWA endores sexism!”, or “SFWA is ruled by liberal fascists!”) and discussing gender as evidenced in the work (e.g. “Covers depict women in X fashion, and that has implications of Y”, or “Author X subverts traditional gender power dynamics in their work by doing Z”, or even “Historically, women editors did Q, as compared to male editors who did Z”). Note the distinctions in punctuation, subjects, objects, comparatives, and conclusions. I would hope professional SF/F writers can grok the difference in approach, tone, and context. Many people have noted the difference in reaction to Resnick/Malzberg’s original dialogue (in issue #200), CJ Henderson’s “Barbie” article (in issue #201), and Resnick/Malzberg’s most recent piece (in issue #202, here). The original articles were problematic: They used language in a fashion out-dated by today’s standards or employed condescending metaphors unwisely. Their language made me and many other critics wince. Many people voiced their complaints about this rhetoric then, but the reaction was relatively muted. Not so after issue #202. Why the difference in reaction? Several reasons, one of which may be that the earlier pieces were (for all of their myriad problems, most of which I consider to be significant) more professional in their content by the standard I propose above than Resnick/Malzberg’s most recent screed. I think that as a genre we can do better. We already do better in many places. If we look at the discussion around gender bias in reviewing, if we look at the debate around this year’s all-male Clarke Award shortlist, if we look at Jim Hines’ writing about cover art, if we look at Kameron Hurley’s essay about women warriors, it is clear that as a genre we can do it right. As professional writers, we should all have the rhetorical chops to focus our writing on the work itself. After all, isn’t that what we all have in common? A passion for science fiction and fantasy? Focusing on the work is the very soul of professionalism, and I do not believe that should be too much to ask of SFWA’s trade publication. Ensuring that the publication adheres to such standards should be the responsibility of its editor, and by extension the SFWA Board. This particular issue of professionalism is far less exciting than the vocal outcry against perceived sexism, perceived thought control, or outright racism. It’s not as likely (I think/hope) to get emotions riled. But if we don’t explore and address this more prosaic question (and do so – dare I say it – in a professional fashion), then we’ll just end up having this furious debate yet again. Instead, I think we should all be focused on telling better stories, selling more books, entertaining more readers. And that focus should be reflected in our professional trade publications. If we do that, the offensive attitudes of individuals like Vox Day and Resnick/Malberg will be consigned to the dustbin of professional irrelevancy. PLEASE NOTE: If you are a SFWA member and have an opinion on the expulsion of Theodore Beale/Vox Day from SFWA, you should bring it to the attention of SFWA’s Board and your regional director.